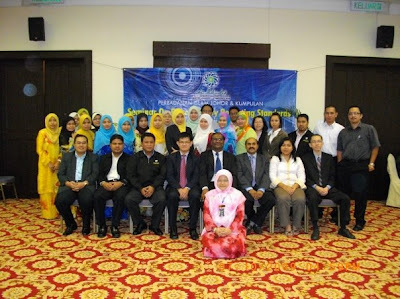 On 6 & 7 October 2009, I was invited by AAG to conduct a two days’ seminar on Private Entity Reporting Standards for the accounting staff from Perbadanan Islam Johor Group. Although this is my expertise and it’s not my first attempt to conduct seminar, speaking in front of a group of 30 people is a new experience and challenge for me. What’s more? The gap of the participants’ academic qualification and experience is wide, from SPM to Degree holders, from accounts assistants to accountants. 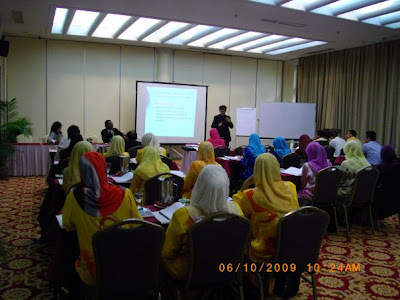 This is another challenge for me to prepare the training materials that can suit all the participants’ knowledge. In any seminar in the market, this kind of composition is rare! However, they are very serious in improving the current accounting practices, I have to try my very best to achieve their course objectives. The seminar is planned to be officiated by the Deputy General Manager of PIJ Group at 9 am. The traffic heading to Senai is very busy in the morning, luckily I set off quit early and reached Mercure Johor Palm Resort & Golf at about 8.30 am. The official opening of the seminar was delayed as the DGM was late, and it’s my show time… I have to thank Jeanie (Alice’s sister) for helping me to draft the opening speech in Bahasa Malaysia. In fact, quit “tough” for me to speak in BM as I didn’t speak “proper” BM for a very long time. After presenting for about 10 minutes, DGM arrived and we had the official opening. They are very serious on this seminar, and everything is so formal. 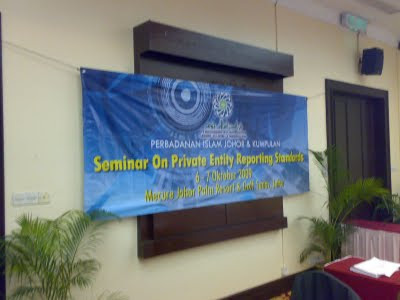 Speeches by DGM of PIJ Group, Partner of AAG, etc… They even prepared a banner solely for this seminar, a “wow” for me! After the opening ceremony, we had the tea break. A special “VIP” table is prepared. Another “wow”, this is also rare for the past seminars that I have attended. My show time continued after we had our short tea break. As we are aware, in order for us to learn effectively, it’s important to have two-ways communication. Thus, I have prepared gifts for those who answered my questions correctly, and a mystery gift for the participant who asked most questions during the seminar. Haha, I am trying to be more creative. During lunch, a special “VIP” table is also prepared for us. The good thing is that we don’t have to queue up to take foods, hotel staff served the foods. Bad thing is that almost all the foods served are meats…!! Anyway, I just wish to fill up my stomach! 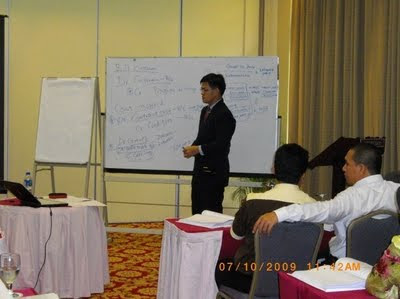 After lunch, I seemed to lose control over the time allocated to each topic as I tried to give more examples to ensure that they understand the concepts, and the key accounting personnel are also quit keen to ask questions. Our seminar for day 1 supposed to be ended at 5 pm, but we extended for another ½ hour. 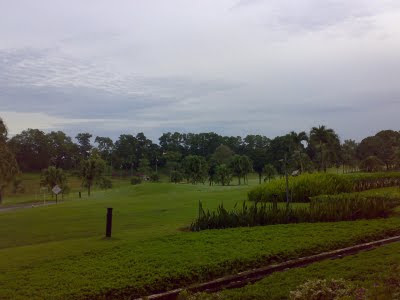 Initially, I planned to tee off at Palm Resort for 9 holes after the seminar. Too bad, it’s too late and I cancelled my plan. While I was walking toward my hotel room, I discovered that the swimming pool is just in front of my room. That’s not a bad idea as I like swimming too, I then switched my plan to swim for almost 40 minutes. A very nice exercise after a day of talking and stress! When I wish to return to my room, something silly happen, I took out the wrong card. I took the car access card instead of room card! No choice loh, I used the towel to cover myself and barefoot walked to reception to get another access card! Haha, feel so embarrass! When I returned to the room, felt a bit hungry, and I noted that there is a food basket on the table. When I opened it, wow, there are few pieces of biscuits and a “golf ball”. I was curious what is that “golf ball”, I squeezed it and it’s broken… haha, it’s actually white chocolate! Dinner was scheduled to start at 7.45 pm, but GM of PIJ Group arrived at about 8.20 pm. BBQ dinner was “formally” started after the speech given by GM. Again, most of the dishes are meats, oops! And I sited beside GM… Though it’s a buffet dinner, foods are served for “VIP”. Indeed, it’s not fun lah! After taking vegetarian foods for more than 6 months, I realise that I can’t take too much meats, my stomach easily full with just taking a little meats. Good sign?! Perhaps! Dinner ended at about 10 pm, and I went back to hotel room to take rest while read through next day’s topics to get more familiar with it. Early in the morning, when I opened door to balcony, awesome!! The golf course is just within 100 meters! What a nice scenery, too bad my stay is so “short” here and “no time” for golf! Second day’s seminar is scheduled to be commenced at 8.30 am, and I went for breakfast at about 8 am. Luckily, no VIP seats for breakfast!! I can choose what I like to eat, like, salads, fruits, porridge, etc… Light and healthier food! When I reached the seminar room, the assistant accountant of PIJ came to talk to me, and commented that the materials I covered were too “technical” and lower level staff had difficulties to understand! Also, I spoke in English, they also have problem in absorbing what I spoke! Oops, that’s the worries I had!! Though I have tried my very best to put in more practical examples, and use more accounting entries to elaborate the concept, they still have problems! Anyway, I tried again to slow down! 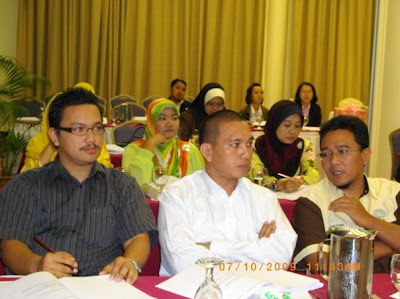 Hopefully, they can at least benefit from second day’s seminar. My part ended at about 3 pm and the next two hours belong to AAG for communicating audit issues. Before I ended my session, I announced that the mystery gifts went to En. Khai, the internal auditors of PIJ Group, he has asked 30 questions! Wow! He received RM50 MPH cash voucher, “courtesy” of Ivan, haha! PIJ also presented a souvenir to me, represented by the Finance Manager, Cik Fara. Haha, a surprise for me oh! At the end of the seminar, we had a group photo!! Nice?! Though there may be some misunderstanding on the “objectives” of the seminar, generally, the participants are nice and it’s a great experience for me!